These new findings could have implications for glaucoma. Glaucoma involves a dysfunction of nerve cells in the retina and brain that become over excited in part because GABA receptors may not be functioning properly. von Gersdorff continues, "For example, maybe a vitamin C-rich diet could be neuroprotective for the retina -- for people who are especially prone to glaucoma. This is speculative and there is much to learn. But this research provides some important insights and will lead to the generation of new hypotheses and potential treatment strategies." Ionotropic GABA receptors (GABAA and GABAC) belong to the Cys-loop receptor family of ligand-gated ion channels. GABAC receptors are highly expressed in the retina, mainly localized at the axon terminals of bipolar cells. Ascorbic acid, an endogenous redox agent, modulates the function of diverse proteins, and basal levels of ascorbic acid in the retina are very high. 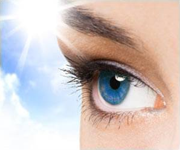 However, the effect of ascorbic acid on retinal GABA receptors has not been studied. Here we show that the function of GABAC and GABAA receptors is regulated by ascorbic acid. Patch-clamp recordings from bipolar cell terminals in goldfish retinal slices revealed that GABAC receptor-mediated currents activated by tonic background levels of extracellular GABA, and GABAC currents elicited by local GABA puffs, are both significantly enhanced by ascorbic acid. In addition, a significant rundown of GABA puff-evoked currents was observed in the absence of ascorbic acid. GABA-evoked Cl− currents mediated by homomeric ρ1 GABAC receptors expressed in Xenopus laevis oocytes were also potentiated by ascorbic acid in a concentration-dependent, stereo-specific, reversible, and voltage-independent manner. Studies involving the chemical modification of sulfhydryl groups showed that the two Cys-loop cysteines and histidine 141, all located in the ρ1 subunit extracellular domain, each play a key role in the modulation of GABAC receptors by ascorbic acid. Additionally, we show that retinal GABAA IPSCs and heterologously expressed GABAA receptor currents are similarly augmented by ascorbic acid. Our results suggest that ascorbic acid may act as an endogenous agent capable of potentiating GABAergic neurotransmission in the CNS. Author contributions: C.I.C., E.V., H.v.G., and D.J.C. designed research; C.I.C., E.V., G.M.-C., and D.J.C. performed research; L.G.A. contributed unpublished reagents/analytic tools; C.I.C., E.V., H.v.G., and D.J.C. analyzed data; E.V., H.v.G., and D.J.C. wrote the paper. ↵*C.I.C. and E.V. contributed equally to this work.